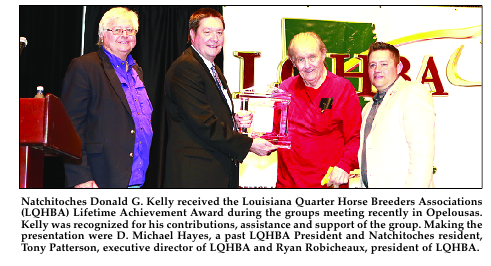 The Louisiana Quarter Horse Breeders Association (LQHBA) honored Natchitoches’ Donald G. Kelly with a special award at its annual LQHBA Membership Meeting and Awards Banquet recently at Evangeline Downs in Opelousas. Kelly was honored with a Lifetime Achievement Award by the state’s Quarter Horse association for his extraordinary contributions and dedication to the organization. The 76-year-old is a longtime resident of Natchitoches, having graduated from Red River Senior High School in Coushatta before attending the University of Mississippi and then Northwestern State University in Natchitoches. He earned his law degree from Louisiana State University Law Center in Baton Rouge. A Democrat, Kelly served as a member of the Louisiana State Senate for 20 years. Kelly was a five-term State Senator representing Natchitoches, Winn, Sabine and Red River Parishes from 1976 until his retirement from public office in 1996. He was also a member of the Louisiana Constitutional Convention of 1973. A key leader in the Louisiana Senate for Governors Edwin Edwards and Buddy Roemer, Kelly was inducted into the Louisiana Political Museum and Hall of Fame in Winnfield in 2008. As a prominent attorney with the law firm of Kelly, Townsend & Thomas, Kelly specializes in criminal law and retirement matters. His passion and enthusiasm for public service spilled over into his involvement with the horse industry of Louisiana. Kelly began breeding Quarter Horses in Louisiana in 2000. The state has a rich history with both Quarter Horses and Thoroughbreds and three of his horses advanced to the highest level of competition. He served as the attorney for the Louisiana Quarter Horse Breeders Association from 1998-2011. “It was a pleasure for our board of directors to honor Donald Kelly with a lifetime achievement award at our LQHBA Awards banquet,” stated Ryan Robicheaux, LQHBA president. “He is an incredible leader in our state and has shown a tremendous dedication to Louisiana breeding. Our industry is richer due to his contributions and we are very grateful.” LQHBA is the state racing affiliate of the American Quarter Horse Association. It is also the official registry for accredited Louisiana-bred racing Quarter Horses and is recognized by the Louisiana Legislature and the Louisiana State Racing Commission. Since its inception in 1966, the association has developed many programs to further breeding and racing in Louisiana. Last year in Louisiana horsemen competed for over $21 million in purses, and breeders’ incentives for mares and stallions of accredited Louisiana-bred foals totaled approximately $4.8 million. LQHBA oversees the annual LQHBA Yearling Sale and Fall Mixed Sale and has raised and donated over $500,000 to support its Louisiana youth scholarship program.